Review posted April 4, 2009. Hyperion Paperbacks, New York, 2006. 396 pages. Back in 1990, when the brilliant cartoonist Mo Willems was young and fresh out of college and not ready to leap into the grown-up world of work, he was fortunate enough to take a trip around the world. We are fortunate that he recorded his experiences in the form of one cartoon drawn each day of his journey. He wrote a caption and date for each cartoon, and the modern author has filled in some details that inspired the drawing. The result is a delightful and quirky window on the world, from the eyes of one of those scruffy backpackers. I lived in Europe for ten years, so even though I was there after Mo Willems had already left, I felt like I had seen him! 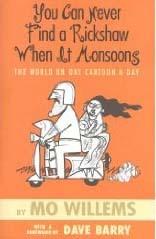 On top of the interesting way of looking at the world, his gifts as a brilliant cartoonist were already showing. He expresses the people of the world, and the experiences of travel with a few lines. Yet the result is instantly recognizable. Take an amusing armchair journey around the world with this book.